What I didn’t realize back then was just how important a sanctuary this rock was for rare seabirds. I discovered that while on a recent reporting trip in Oregon, when I had a few hours to spare and decided to make the nostalgic, winding drive on U.S. Route 26 from Portland to Cannon Beach. There was that rock shrouded in mist just as I remembered it. And the beach was just as popular, crawling with people, only now visitors were taking iPhone selfies with the rock in the background rather than using old Nikon cameras. A small crowd was gathered around a tall, bearded man in a fleece vest, clutching binoculars and standing by a pair of high-powered scopes on tripods trained on the rock. “Well, they’re up there somewhere,” Art Broszeit said, softly, as he patiently scanned the rock, looking for the elusive tufted puffin. 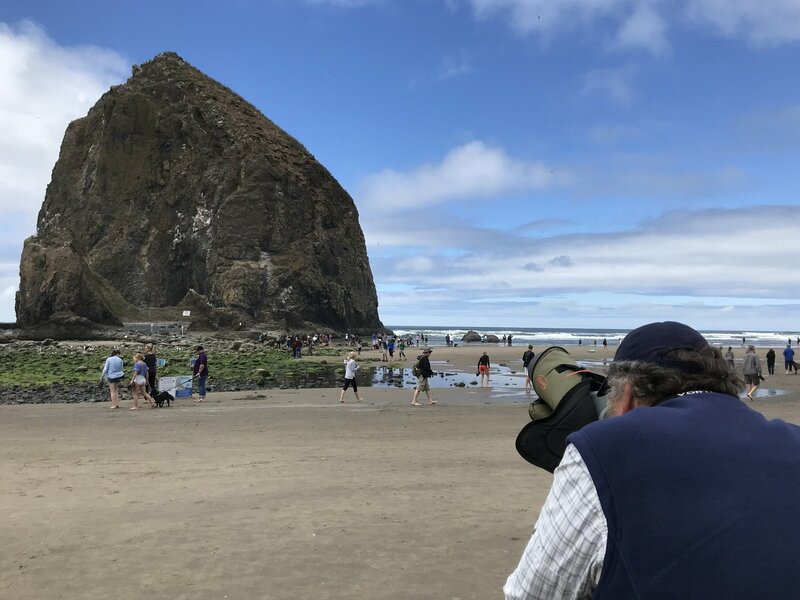 Cannon Beach locals have nicknamed Broszeit the “Puffin Man,” a citizen scientist and de facto expert on the exotic cold climate birds that are becoming harder and harder to find. 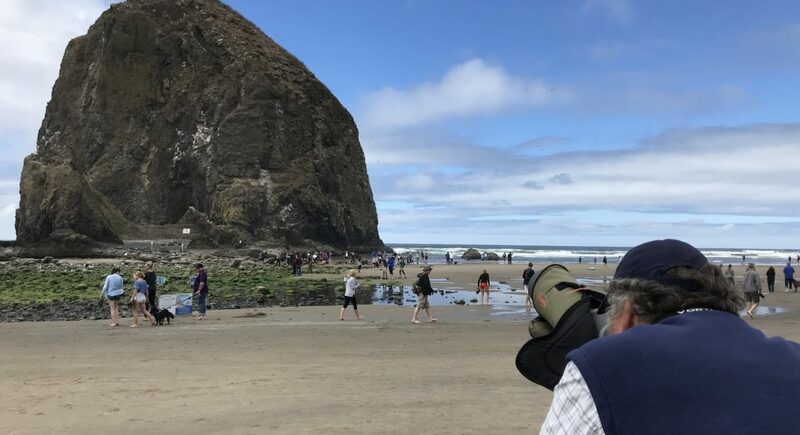 Broszeit is actually one of tens of thousands of volunteers that agencies like the National Park Service rely on every year to conduct wildlife studies, field surveys, or in this case man a pop-up, mobile interpretive center about tufted puffins on Cannon Beach. “Everyone wants to come here and see puffins,” Broszeit said. “I’ve had people specifically go to Iceland to see puffins and don’t see them.” But they’re relatively easy to see in Oregon most summers. In fact, this may be one of the most accessible places in the world to get a glimpse of one. They’re amazing. 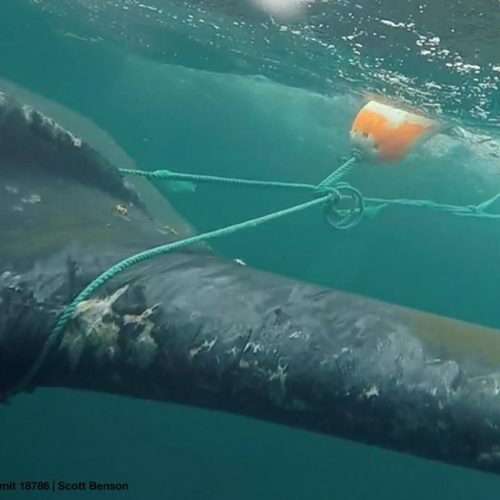 They have black and white faces, black bellies and a bright orange bill that has hooks in it that enable them to catch and hold fish. Right now, during the mating season, both the males and females have grown their signature “tuft,” which looks like a strand of coiffed blond hair. There used to be hundreds of puffins nesting on the rock. This summer, the local Haystack Rock Awareness Program estimates there are only 30. One reason there are fewer birds, according to scientists, is that their food source is becoming harder to reach due to climate change. The puffins are a diving bird, sometimes plunging 40 feet or deeper into the ocean to catch fish. 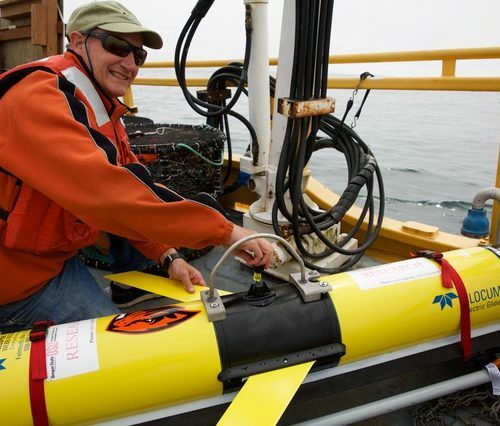 As ocean temperatures warm, those fish are going deeper down to survive. “So the fish are going down deeper into colder water and a lot of the birds just can’t reach them,” Broszeit says. So I was glad I decided to return to Cannon Beach to see them while I still can. We also spotted a bald eagle, cormorants, black oystercatchers and cliff swallows. I remembered how cool it was to explore the vast tide pools beneath the rock too when I was a kid. I was reassured to find that this clearly hasn’t changed when I caught up with Connor Reblkin and his family, on a summer road trip from their home in the Canadian province of British Columbia. “I’d like to live up there, wouldn’t you?” Connor asked. Watching over it all, Art Broszeit beams. 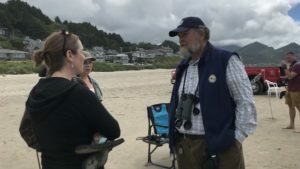 Whether he’s looking for puffins or answering questions from curious beachgoers, he says it’s great to volunteer and give back, especially when it comes to getting people interested in science. “If I can spark interest in one or two young people to enjoy the outdoors, and look through the binoculars, it’s a good day for me,” he says. Broszeit, a retired engineer, has volunteered at public lands sites from the Everglades in Florida to Dinosaur National Monument in Utah and Colorado. 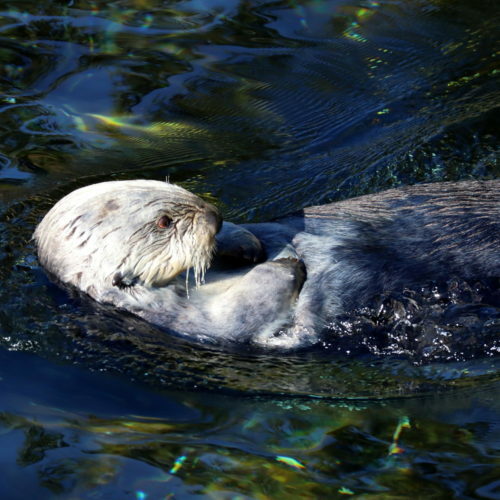 He counts his latest four-month stint here on the Oregon Coast among his favorites. So what’s next for the Puffin Man? Maybe home for a little bit of a break and then it’s on to pick a new wild place to enjoy with visitors. As for me, my short road trip diversion is over and it’s back to my actual reporting beat. It’s hard not to feel a little nostalgia driving away. 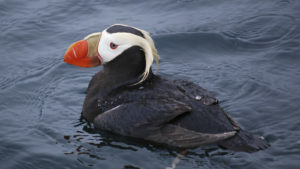 I know I can come back — but I wonder how long that will be true for the tufted puffins?